Rotate pieces and blend their colors, relax to the sound of rain, and keep the flowers from spreading with today’s collection of apps and games. Relax Rain ($1.99 → Free, 17.4 MB): Leave the world behind with Relax Rain. Those who are easily distracted. Relax Rain is available for free for a limited time. It has a 4-star rating with a total of 28 ratings. Flower Board – A relaxing puzzle game ($0.99 → Free, 18.2 MB): Keep the flowers from spreading in Flower Board. Fans of puzzle games. Flower Board is the perfect casual game. It requires you to group six or more matching balls together in order to remove them from the board. New balls are added after each of your non-matching moves, so you’ll have to do your best to keep the board from filling up. The game includes multiple themes to choose from, power-ups, undo, three difficulty levels, and leaderboards via Game Center. 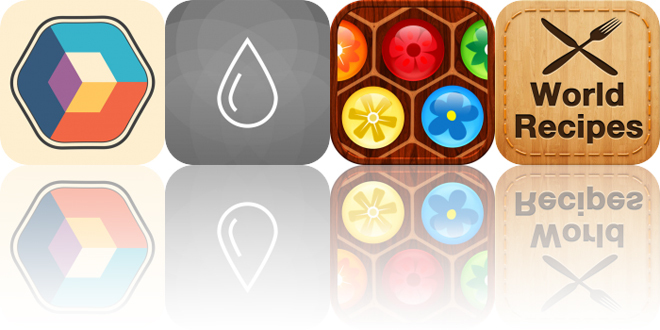 Flower Board – A relaxing puzzle game is available for free for a limited time. It has a 4.5-star rating with a total of 672 ratings. Colorcube ($0.99 → Free, 37.2 MB): Rotate pieces and blend their colors in Colorcube. Gamers who want to destress. Colorcube provides a relaxing experience focused on experimentation. In each level, you’re given an image to recreate. Select the pieces you need to solve the puzzle, and rotate them into position. Colors can be changed with a tap, and overlapping pieces will blend their colors. The game includes more than 250 handcrafted levels. Colorcube is available for free for a limited time. It has a 4.5-star rating with a total of 126 ratings. DoubleDown Casino & Slots – Vegas Slot Machines! ($1.99 → Free, 43.6 MB): Spin the reels and go for broke in DoubleDown Slots and Casino. Those who love the excitement of Las Vegas casinos. Step into the largest free-to-play casino in the entire App Store. You’re able to choose from more than 70 authentic slot machines including Wheel of Fortune, Double Diamond, Golden Goddess, DaVinci Diamonds, and more. Exclusive machines are frequently added, and you can even play IGT slots pulled straight from the casino floors. Daily bonuses, free spins, and tournaments allow you to quickly build up your chip stack. Video Poker, blackjack tables, and roulette tables are also available. DoubleDown Casino & Slots – Vegas Slot Machines! is available for free today only (08/08). It has a 4-star rating with a total of 103442 ratings. World Recipes – Cook World Gourmet ($0.99 → Free, 59.7 MB): Discover new recipes from countries all across the globe with World Recipes. Home chefs. The app includes recipes from a wide variety of countries and cultures including American, Indian, Mexican, Chinese, Caribbean, French, Greek, Italian, and Japanese. Each recipe details where it’s from, the ingredients needed, and directions and tips on how to prepare it. World Recipes includes search, the ability to save your favorite dishes, and a built-in shopping list. World Recipes – Cook World Gourmet is available for free for a limited time. It has a 4.5-star rating with a total of 91 ratings.